They say money makes the world go around -- looks like you lose again, inertia! 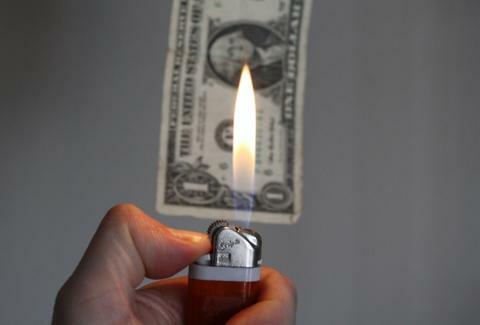 Making light of society's most coveted social construct: Burn Your Money On Tax Day. An effort to publicly raise five thousand dollars in order to steal it and move to Mexico defiantly torch it on April 18th, the bill burning's a tongue-in-cheek Kickstarter project from a Denver artist totally unafraid of a $500 police fine, as being an artist, he probably has no conception of what $500 looks like. While seemingly very, very dumb, the pyro-money-ac's assertions of intelligent performance art are persuasive, as he demands the venture questions both the whole concept of crowd-funding (raising money to destroy it just because people are willing), and draws attention to the "intrinsically worthless nature of the physical bank notes", and our tax system's "paradigm of greed" contributing to the global "wealth gap", also the name of a store where you can buy boxers for hundreds of dollars. No, actual boxers. The incremental rewards include: a slogan'd sticker for a pledge of $10 or more, a "portion of residual ash in a commemorative urn" for $20, and for a c-note, a large, archival print of the burning money that'll be framed, just like you'll claim you were, when the cops bust in and try to fine you $500. As with all Kickstarter projects, this thing is time-sensitive: the whole endeavor gets dropped if they don't reach 5k by mid-March, and as the grand total is currently $80, they badly need your momentum, or would, if such a contrived phenomenon actually existed.